A recent bird survey on Girley Bog NHA, Co. Meath reveals the importance of the site for Ireland’s breeding bird populations. 29 species of bird were recorded during the survey including four species of conservation concern. These are Meadow pipit (Anthus pratensis), Yellowhammer (Emberiza atrinella), Linnet (Carduelis cannabina) and Sand martin (Riparia riparia). The diverse bird life on Girley Bog can be explained by the variety of habitats found on the site. Habitats include raised bog, cutover bog, coniferous woodland, scrubland, semi-natural grassland and broad-leaved woodland. 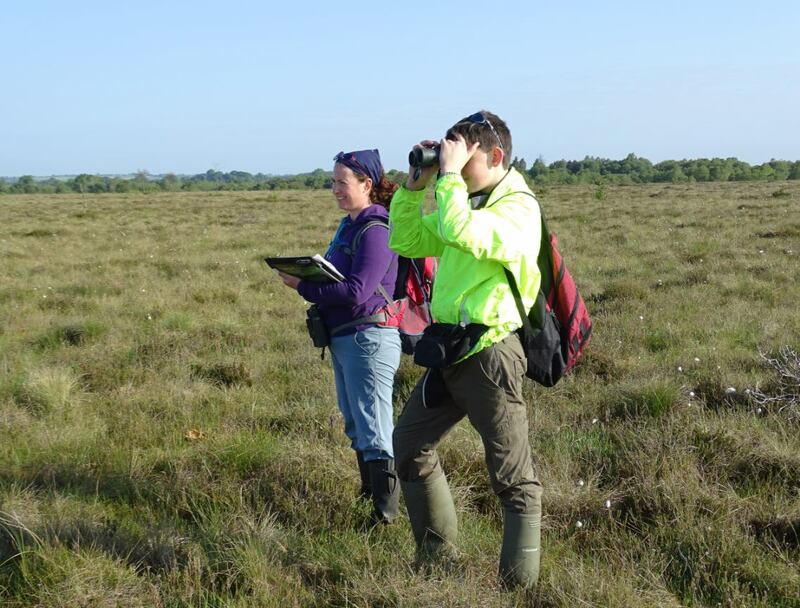 The Irish Peatland Conservation Council (IPCC) recently undertook two detailed bird surveys (one in May and a second in June) along a 3km transect on Girley Bog with the help of experienced volunteers. Species were identified by their calls and songs. The project was supported by Meath County Council under their Community Heritage Grant Scheme 2018 and sought to gain an understanding of the importance of the site for Ireland’s breeding birds. Meadow pipits are red listed in Ireland due to sharp breeding declines recorded as a result of severe winters in 2009/2010 and 2010/2011 (1). Although populations have seen signs of recovery since then, wetland sites such as Girley Bog are extremely important for the species. Yellowhammer have seen a drastic decline across Ireland and are now only found in the east and south, they are strongly tied to cereal cultivation – feeding on grains of grasses and cereals (1). They nest in hedgerows. Once again protected sites such as Girley Bog are important refuges for this beautiful bird. Linnet are a widespread Irish resident that can be found in a variety of habitats however, they have been Amber listed due to a recent European decline. Sand martin are also Amber listed due to a depleted European population (1). They breed in burrows dug into riverbanks, quarries and in the case of Girley Bog peat banks. They winter in sub Saharan Africa making the long journey across the Saharan desert in autumn and spring. Other summer visitors included Blackcap (Sylvia atricapilla), Chiffchaff (Phylloscopus collybita), Sedge warbler (Acroephalus schoenobaenus), Whitethroat (Sylvia communis) and Willow warbler (Phylloscopus trochilus). 23 of Ireland’s resident bird species were also recorded on the site making it a great place for keen birders to visit all year round. See note 2 for the full bird list. It is vital that Girley Bog continues to be protected and managed for wildlife so that these birds can continue to breed on the site. This entry was posted in News and tagged Birds, Bogs, Conservation, Girley, IPCC, Meath. Bookmark the permalink.